Great Turn Out for Jane’s Walk: Turtles at Petrie Island on Saturday May 3rd! On an early May Saturday Al Tweddle and Eva Kasanda hosted 41 intrepid Jane’s Walkers on a Turtle Trail walk and talk. This year the Ottawa River cooperated allowing the visitors access to the island and the Grand Maitre Nature Reserve. The tour started in the Interpretive Centre, providing shelter from some light rain and allowing visitors to learn about the efforts of the Friends of Petrie Island and the wildlife that lives on the island. Outside one brave Map Turtle (Graptemys geographica) showed his (or her) face and Eva Kasanda introduced the group to a pet Red Eared Slider (Trachemys scripta elegans) turtle (courtesy of Bill Bower) and she talked about the dangers of releasing this type of non-native species into the wild. The tour finished up with a visit to the Experimental Turtle Nesting Site. Al and Eva received lots of great questions and comments and FOPI is looking forward to hosting more walks and talks this year! Promotion of this event and other Jane Walks were seen in Apartment 613, Green Living Ottawa and the Ottawa Citizen! Thanks to everyone who came out! is new this year. Portions of the beaver loop are too flooded to walk through. We proceeded to the sand dune at the west end of the trail, on our way passing a collection of Bladder Nut. As we approached the Ottawa River shoreline we found that the sandy beach along the River Trail was completely under water. the top of your boots, watch your step! 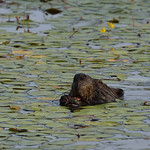 beaver caught eating dinner ! Flooded picnic area at Petrie Island. Eva, one of our monitors trekking through the flooded picnic area. muskrat seen along one of the nature trails!